Kyle Randolph McCormick was born in Prairie du Sac, WI on April 1st 1985. He was the best April fool’s joke the McCormick family ever had. From an early age until 14 Kyle won every game of memory, candyland, and chutes and ladders. After age 14, his younger siblings, Kieth and Janel, were old enough to understand the rules and occasionally win. Though today, Kyle suspects his loving mother purposely loses to make him feel better about himself. Graduating from Iowa State with a finance degree and student loans, he soon realized a job would be needed to earn money. Kyle moved to Des Moines and worked for Principal Financial. He soon followed his professional passion to community banking at Freedom Financial Bank. There, he helps small businesses and local investors succeed in Des Moines. The first UCAN event Kyle participated in was the Fall cleanup. Seeing the need in the community he was excited to become more involved and has since become a board member. He is privileged to chair the Friends of Parks committee who keeps Urbandale’s parks and trails clean and green. 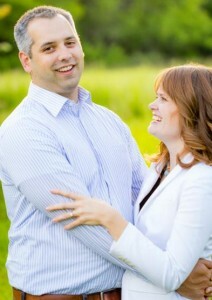 He is blessed with a loving wife, Julia, who is a good sport and helps when volunteered by her husband. There a lots of opportunities to join UCAN and be an impact volunteer, especially with the holiday season fast approaching. Kyle enjoys meeting fellow volunteers and hopes to see you join the fun soon!